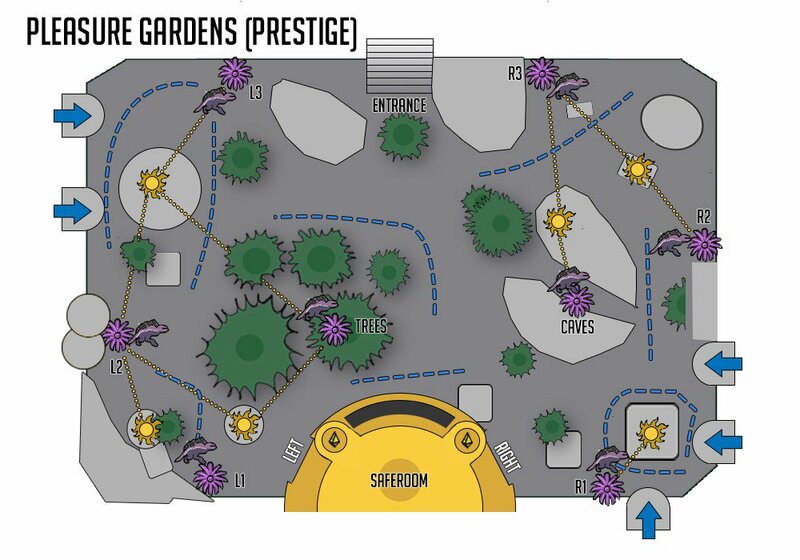 Use this Pleasure Gardens Prestige map to help you locate the dogs and avoid being detected in the Destiny 2 Leviathan raid! For those Guardians out there who have run the normal Leviathan raid countless times, the next challenge that awaits is the Leviathan Prestige mode. The Pleasure Gardens encounter now has additional Royal Beasts, they have more health, and their pathing is altered, so be sure to take this Pleasure Gardens Prestige map with you on your journey. Credit for this beautiful map of the Prestige version of the Pleasure Gardens goes to reddit user Oniji, who submitted it to the DestinyTheGame subreddit back in late October. There are a few notable differences with the Pleasure Gardens Prestige version of the raid. As mentioned above, there are additional Royal Beasts – two more have been added – and the pathing of the dogs are different. The Royal Beast closest to L1 now turns in towards the flower instead of heading closer to the safe room; the dog that usually moves across the entrance to the Gardens now has a path from L3 down to trees, with the additional dog taking its place through the middle; the beast near R3 no longer hugs the wall but moves out towards cave; and finally, an additional Royal Beast walks back and forth in front of the safe room. All of this makes it more difficult to move around the map, but there are still safe routes that can be taken. For instance, to reach trees, it’s now better to exit the left side of the safe room and head directly to trees. You can still move from trees into caves, you just need to be aware of the Royal Beast moving through the middle of the map, as well as the one in front of the safe room. Reaching L3 and R3 are actually slightly easier, thanks to the dogs being in full view of the Spore carriers, as opposed to hidden behind objects. However, R2 is still just as difficult to reach, especially with the shorter pathing of the R2 dog. The Prism Weapon carriers must now be extremely careful about jumping from sunspot to sunspot, as there are more dogs to detect them. Their callouts will also need to be precise. Thankfully, if all the Spore carriers have this Pleasure Gardens Prestige map on hand, they’ll be able to know where the dogs should be at any given moment. Be sure to check out our Destiny 2 Complete Strategy Guide, as it contains links to the other Destiny 2 Leviathan Challenge modes as well as a myriad of other tips and walkthroughs. Will Days Gone release on the Nintendo Switch? Will Days Gone release on Steam and PC? Is Mortal Kombat 11 coming to Nintendo Switch?